https://i2.wp.com/www.preventionhealthsciences.com/wp-content/uploads/2015/12/what-is-oral-mucositis.jpg?fit=900%2C624&ssl=1 624 900 Chris Donley https://www.preventionhealthsciences.com/wp-content/uploads/2018/12/prevention-logoBuffer.png Chris Donley2015-12-25 09:00:322016-01-22 17:11:54What Is Oral Mucositis? Why Try Oncology Mouth Rinse? https://i1.wp.com/www.preventionhealthsciences.com/wp-content/uploads/2015/11/get-relief-with-magic-mouthwash.jpg?fit=900%2C600&ssl=1 600 900 Chris Donley https://www.preventionhealthsciences.com/wp-content/uploads/2018/12/prevention-logoBuffer.png Chris Donley2015-11-20 09:00:012016-01-27 11:32:32Why Try Oncology Mouth Rinse? Mouth sores can be painful and distressing. They can range from a mere inconvenience to a severe complication that may make you unable to continue your cancer treatment. Cancer-related #mouth sores are sores or ulcers that form on the inside lining of your mouth or on your lips. The mouth sores appear burn-like and can be painful, making it difficult to eat, talk, swallow and breathe. Sores can appear on any of the soft tissues of your lips or your mouth, including your gums, your tongue, or the roof and floor of your mouth. Sores can also extend into the tube (esophagus) that carries food to your stomach. Chemotherapy and radiation — alone or combined — can cause mouth sores. That’s because these cancer treatments are intended to kill rapidly growing cells — such as cancer cells. Some healthy cells in your body also divide and grow rapidly, including the cells that line the inside of your mouth. Unfortunately these healthy cells are also damaged by chemotherapy and radiation. This product of yours is outstanding and a breakthrough in the treatment of a variety of skin injuries. I have informed ER physicians about this product and they are anxious to have it available for emergency room injured patients. I give this product my highest endorsement as I have had practical experience with it use. I have been using Prevention wound and burn spray in our hospital for almost 10 years. It assists in both pain management and the healing of many different types of wounds. It works extremely well in combination with Silver based bandages and I can attest to a dramatic reduction in healing time as apposed to just NACL irrigation. I swear by the product and would recommend it to anyone! I have a recurring wound that when it flairs up and become infected causes me extreme pain. I was fortunate to know someone who introduced me to the wound and Burn spray product and the results are nothing short of Phenomenal! It not only help tremendously with the pain my wound heeled in a week, normally it takes 3 to 4 weeks! I found the Wound and Burn Spray at Walmart and showed it to my home health aid who changes the bandages on my foot Ulcers. She had not heard of the the product but agreed to try it during the bandage change. The most relief I have ever had! I wish I knew about this product years ago. Prevention’s blend of cations and anions complexed with an oxidant is proving to be clinically effective in treating burns, abrasions and wounds with a reduced healing time in most individuals. The unique formulation of chemicals is controlling the pathogenic organisms and fungi that cause delay in tissue healing in most lesions. This formula is promoting healing in burns, abrasions and incisions with little or no scar tissue. The ability of this spray to stop and reverse the body’s natural inflammatory process and control the bacterial environment of the lesion enables the body’s natural tissue response to be more effective in repairing the damaged tissue. Formula effectively controls fungi, virus and pathogenic bacteria. This formula in an FDA protocol tissue toxicity study revealed no mucosal irritation, inflammation, hyperplasia or atrophy. The formula exhibited an bactericidal effect on the tissue and reduced all previous existing chronic inflammatory changes. This formula promoted overall regeneration of the tissue without destruction of the keratin in the epidermal layer. Prevention Wound and Burn spray is safe, easy to use and clinically effective when used as directed. The formula has been used on chemical burns, thermal burns, over-exposure to sun, abrasions, and open wounds with success. The product is providing relief for the discomfort associated with the lesions, controlling infections and significantly reducing the healing time associated with wounds and burns. It is safe for all ages. 1. To control and reduce the number of bacteria and fungi in a burn wound without damaging healthy tissue. Major cause of death in burn victims is infection. Control of bacterial environment is critical. 1. Effective against the staphylococcus species. Epidermolytic toxins of staphylococcus aureus are the causative agents of blisters or generalized exfoliation in burn or scalded skin. • Thermal injury enhancing the invasion of candida albicans and the depth of the burn is an important factor determining the potential for systemic invasion of fungi. 3. Mechanical action from oxygenating agent helps in debridement during healing. • Debridement is essential to allow the Phagocytes a ready access to infecting microorganisms. 4. Cation-anion formula impedes the body’s inflammatory process. (Promotes healing-cell regeneration). • Interferes with the cyclooxgenase and lipooxgenase functions5. Oxygenation action helps keep the tissue moist and provides oxygen to the tissue cells. • The majority of dermal wounds are colonized with aerobic and anaerobic microorganisms that originate predominantly from mucosal surfaces such as those of the oral cavity and gut. 6. The cation-anion formula helps control or reduce the sodium-potassium pump impairment of the tissue cells. Thus impeding the loss of water by the cells and helping with the intake of water by the cells by providing a source of oxygen and hydrogen molecules. Fluid electrolyte imbalance loss by the evaporation of water thru the burned area causes disturbances in the extra cellular and intra cellular fluids. It also will affect body fluid composition. This also can cause a change in composition of blood and the development of acidosis. Body fluids, mineral salts all can be lost thru the wound. The American Cancer Society estimates that there will be nearly 1.7 million new cancer cases diagnosed in 2015. I work in Radiation Oncology. We give each of our Head and Neck Cancer Patients a bottle of the Prevention Oncology Mouth Rinse at initial consult. They find the product helps sooth their oral cavity during treatment. Helps to lessen bacteria also. My husband used this following chemo and radiation. It does a great job for mouth sores. We tried many, but this was the best. Prevention is a wonderful product and an answer to prayers. My mouth and throat had sores developing from chemotherapy which made it difficult to eat. Within a few days of using this product, the sores went away and have not come back through 2 more cycles of chemotherapy. Formulated for Everyday use to promote good oral health and fresh breath. Alcohol-free formula for soothing relief for common mouth sore ailments. Helps sooth and promote healing of canker sore, cold sores, or cut from braces. Our spray is easy and effective to provide pain relief and promote healing for common injuries and burns. Want to learn more about offering Prevention to your customers? 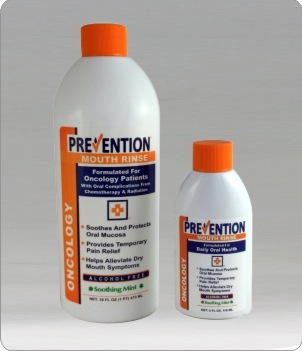 Prevention Oncology Mouth Rinse soothes oral tissue and helps control sore gums, ulcers, and thrush. Glycerin and menthol formula created specifically for oncology patients. Designed to help with Oral Mucositis during radiation and chemotherapy treatment. Alcohol-free #mouth rinse is formulated for #oncology patients receiving chemotherapy and gamma ray treatment. Provides relief from dry mouth and helps control and relieve ulcerations associated with oral mucositis. Effective against candida albicans and thrush, common with patients of multiple medications. Made with pure glycerin, peppermint, menthol and zinc formula. No dyes or petroleum products; vegan and gluten free.